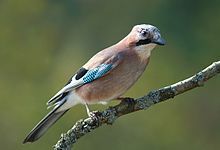 The jay pyot or blue janet (Garrulus glandarius) is a species o bird occurrin ower a vast region frae Wastren Europe an north-wast Africae tae the Indie Subcontinent an forder tae the eastren seabuird o Asie an doun intae sooth-east Asie. ↑ BirdLife International (2012). "Garrulus glandarius". IUCN Red List of Threatened Species. IUCN. 2012: e.T22705764A38312595. doi:10.2305/IUCN.UK.2012-1.RLTS.T22705764A38312595.en. Retrieved 26 November 2016. This page wis last eeditit on 10 Februar 2018, at 23:50.